English army contractor about 1711. He was a wealthy Jew who went to England with William III., and who attained some notoriety by his extensive dealings with the English government of his day. 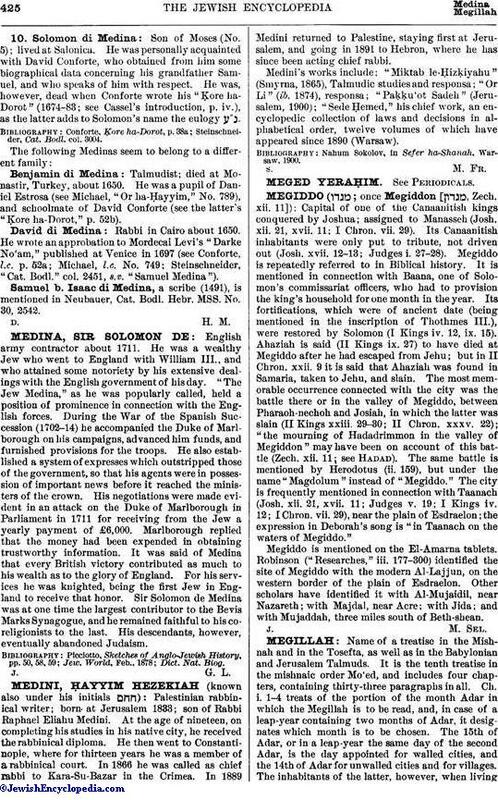 "The Jew Medina," as he was popularly called, held a position of prominence in connection with the English forces. During the War of the Spanish Succession (1702-14) he accompanied the Duke of Marlborough on his campaigns, advanced him funds, and furnished provisions for the troops. He also established a system of expresses which outstripped those of the government, so that his agents were in possession of important news before it reached the ministers of the crown. His negotiations were made evident in an attack on the Duke of Marlborough in Parliament in 1711 for receiving from the Jew a yearly payment of £6,000. Marlborough replied that the money had been expended in obtaining trustworthy information. It was said of Medina that every British victory contributed as much to his wealth as to the glory of England. For his services he was knighted, being the first Jew in England to receive that honor. Sir Solomon de Medina was at one time the largest contributor to the Bevis Marks Synagogue, and he remained faithful to his co-religionists to the last. His descendants, however, eventually abandoned Judaism.